After breakfast this morning at the Villa Ducci in San Gimignano, I was treated to a tour down a medieval stone staircase that led from the breakfast room down to the ancient wine cellar. The cellar and staircase are part of the foundations of the medieval tower that the Villa Ducci was built around in the 19th Century. The villa was then fully renovated again in 1998 and made into the hotel it is now. All the stones and the flooring in the wine cellar and the staircase leading down to it are original – over 700 years old! The daughter of one of the owners showed me around. I told her some of my ideas related to the novel and she was very interested — and confirmed some of my suspicions. I think I might get a whole new plot direction as a result of this morning’s visit! I said my reluctant good-byes to the beautiful Villa Ducci and the amazing view of the towers of San Gimignano and then one of the owners very kindly drove me to the bus stop so I could catch the bus to Siena. The bus ride was not exactly scenic–like all busses, it went a circuitous route through the back ends of the various towns–nondescript to say the least. I arrived in Siena in about an hour and a half and set off cheerfully to find the Palazzo Masi – my 14th Century B & B. I missed a turn (easy to do in Siena!) and did quite a bit of fruitless wandering up and down ancient streets pulling my suitcase behind me before finally whipping out my phone and calling the owner. It turned out I was just about 100 yards from the place! The owner and her husband greeted me kindly and showed me to my room on the 2nd floor. The beams holding up the ceiling are absolutely massive and I have my very own archway leading to a small anteroom containing a desk and chair. I have two windows – huge, tall wooden ones with thick green shutters that open out onto a view of a narrow medieval street. I can lean out the window and not require a great deal of imagination to believe I have been transported back in time. Just take away the odd Vespa speeding down the cobblestones and the occasional lost looking tourists. I had a great lunch at a small trattoria next door. I asked for the piccolo (small) bottle of wine since they weren’t selling by the glass and it was just 4 euros. It was pretty much what we’d consider a half bottle. that’s a lot of wine at 1:30 in the afternoon! But of course I managed. I had a great conversation with a woman sitting next to me from Geneva. She had lots to say for herself! After my lunch, I walked (OK, staggered) the few yards down the street and emerged into the Piazza Il Campo – possibly one of Europe’s most beautiful squares. Well, it’s not exactly a square – more like a shell shape. The legend is that the shape of the campo echoes the all encompassing shape of the madonna’s cloak. Siena has a particularly strong association with Mary. I walked right out into the campo and just lay down on the bricks! Plenty of other people were doing the same so it’s not as weird as it sounds. The bricks are arranged in a beautiful herringbone pattern separated by nine white travertine bands symbolizing the Council of Nine who ran the government in the 14th Century. I know from my research the the brickwork pattern was laid down in around 1340 ish. Anyway, the bricks were lovely and warm and really rather comfortable! I lay down and looked way, way up at the Torre del Mangia – the color of burnt siena against the blue Siena sky. Absolutely wonderful! I just couldn’t believe that I am finally here in Siena after so many months of planning. I had a good long rest on the bricks and then made my way into the Palazzo Pubblico to view the famous murals by Simone Martini and Ambrogio Lorenzetti. They are all much bigger than I expected and just awesome! The Martini one of the general surveying his conquered town and Martini’s version of the Maesta (Mary and child) are particularly well preserved. Here are some pictures from the Internet. A copy of the one above hangs above my bed at the Palazzo Masi! Cool or what? I just love this one and as I mentioned above, it’s incredibly well preserved and extremely large. Below is Martini’s Maesta which at the time (1321) was considered groundbreaking because the various saints are quite individualized. Again, it’s massive and just glows at one end of a huge room. 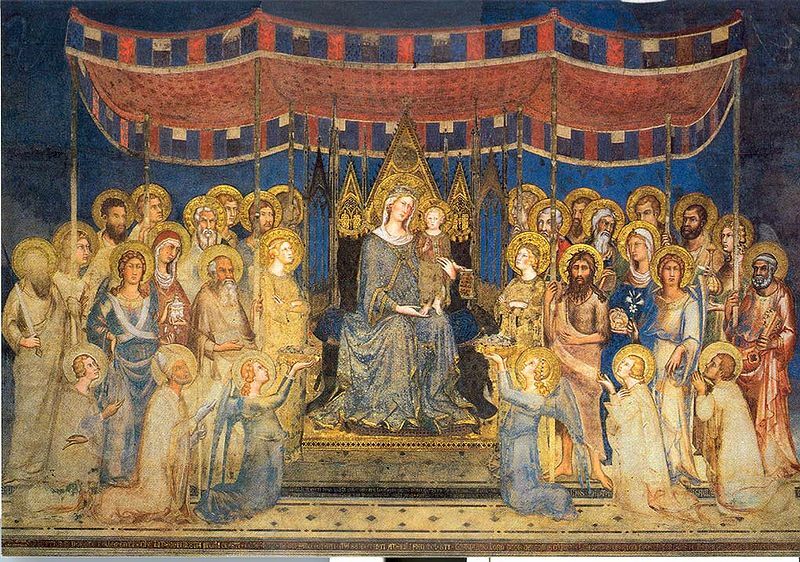 The very famous fresco called Allegory of Good and Bad Government by Lorenzetti is also in the palazzo pubblico. The fresco takes up three full walls. The bad government fresco is quite damaged but most of the good government fresco looks like it was painted yesterday. I just love the architectural details. 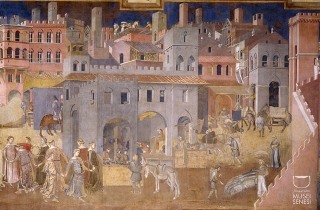 The fresco is credited with being one of the first secular frescoes and one of the first that showed detailed “slice of life” scenes, including those of the countryside. And so after all the art, I retired to a cafe overlooking the campo and drank cappuccino and jotted down some new ideas based on what I saw this morning at the Villa Ducci. Time now to eat (again!). I can’t believe that I’m hungry (again). I’ll have a bit of a stroll around and then probably eat at a place just across the street that was recommended by the woman who runs this place. Tomorrow I’m off for a wine tour of Montelcino and Montelpulciano. Just what I need – more wine.